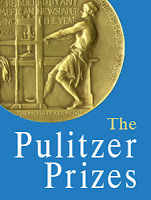 The Pulitzer Prize Winners 2012 have been announced. Pulitzer Prizes will be awarded at a luncheon ceremony at Columbia University in May. "An engaging portrait of a globetrotting diplomat whose complicated life was interwoven with the Cold War and America’s emergence as the world’s dominant power." "A provocative book arguing that an obscure work of philosophy, discovered nearly 600 years ago, changed the course of history by anticipating the science and sensibilities of today." "An exploration of the legendary life and provocative views of one of the most significant African-Americans in U.S. history, a work that separates fact from fiction and blends the heroic and tragic. "A collection of bold, skillful poems, taking readers into the universe and moving them to an authentic mix of joy and pain." No prize for Fiction was awarded this year. For a list of previous winners with links to our online catalog click here.